John Mongelluzzo serves as the Partner-in-Charge of Calfee's Cincinnati Office, and he is a member of the firm's Corporate and Capital Markets practice group. He has extensive corporate and international experience in commercial transactions, computer technology and licensing, government regulation, mergers and acquisitions and litigation management. He also counsels clients on matters of corporate governance and compliance, executive compensation and labor and employment issues. John’s practice includes technology licensing and contracting, including inbound and outbound software licenses; software development and consulting agreements; distribution agreements; maintenance and service agreements; outsourcing agreements; end-user license agreements; source code licenses and escrow agreements; open-source licensing issues; and nondisclosure, confidentiality and secrecy agreements. John joined Calfee in 2012. He was named Partner-in-Charge of the Cincinnati office and has served as a member of firm’s Executive Committee and Diversity and Inclusion Committee since 2013. John was elected to the firm’s Management Committee in 2015. 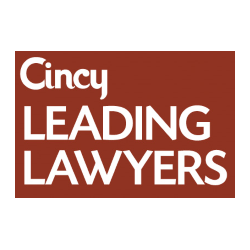 John has been named to the "Cincy Leading Lawyers" list by Cincy Magazine from 2018-2019. John has been named one of Cincinnati’s “Top Forty Business Leaders Under 40” by Cincinnati Business Courier and is a graduate of Leadership Cincinnati. Before joining Calfee, John spent five years as Executive Vice President, Secretary and General Counsel for MSC Software, and before that, he was Senior Vice President, Secretary and General Counsel at SDRC for more than 15 years. John is a member of the American Bar Association and the ABA’s Business Law and Science and Technology sections. He also is a member of the Ohio State Bar, Cincinnati Bar and American Corporate Counsel Associations. He is a member of the American Society of Corporate Secretaries, the American Law Firm Association, Corporate Counsel Committee and the National Association of Corporate Directors. John is a member of the Board of Trustees of Stepping Stones, an agency that serves children and adults with disabilities in the Cincinnati area. John serves on Stepping Stones’ Executive Committee as Vice President, Chair of the Development Committee and a member of the Personnel Committee. John also serves on the Board of the Dan Beard Council Boy Scouts of America, is Vice Chair of its GSAL Committee, and participates in the Boy Scouts Mentoring Program. In addition to serving as the Co-Chair, along with his wife, Kerry, of the 2016 American Heart Association’s Cincinnati Heart Ball, John is Chair of the organization’s Executive Leadership Team. John is a member of the United Way Tocqueville Society and has served on ArtsWave Cincinnati’s Community Campaign Cabinet as well as the boards and various committees of the Cincinnati Ballet, Cincinnati Opera and the Cincinnati Nature Center. John has served as the President of the Board of StarShine Hospice and Palliative Care and as Vice-Chair of the Flying Pig Marathon.